It's a terrifying way to get a temporary tattoo. 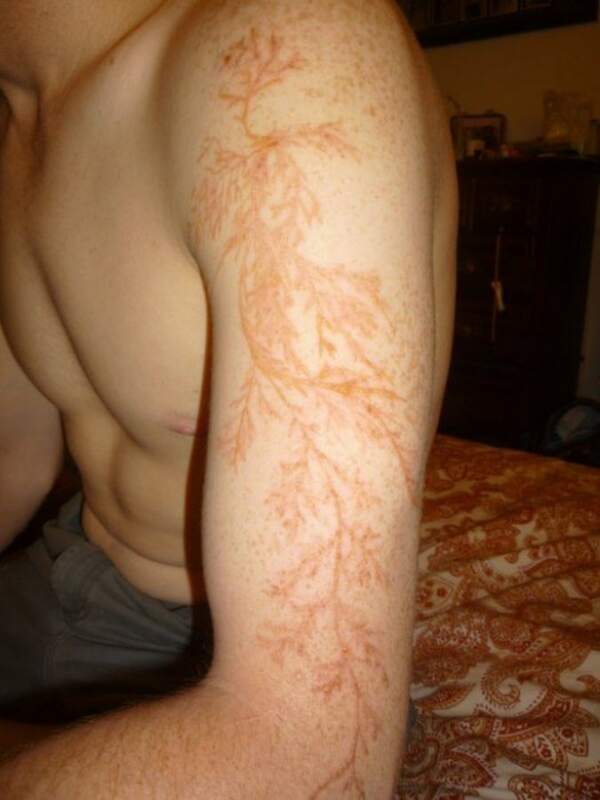 To get the feathery looking, fern-like pattern running down this man's left arm, he first needed to be struck by lightning. 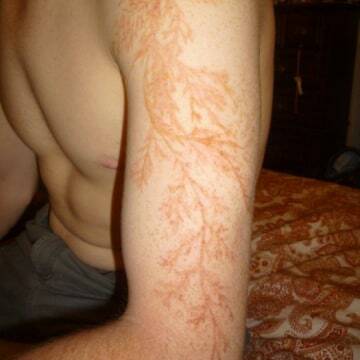 Known as a "Lichtenberg figure," for the German physicist who first described seeing a similar pattern while experimenting with static electricity, these reddish fern-leaf patterns are a skin reaction to a lightning strike. These dramatic "keraunographic" marks are sometimes referred to as "lightning flowers" or "lightning trees." They tend to occur on the arms, back, neck, chest, or shoulders of lightning strike victims. As the tech blog Gear Diary reported, Winston Kemp earned this intricate body art during a spring storm when he went outside to save his pumpkins. Ironically, Kemp is an electrician, but it wasn't his job that put him in contact with this electrical jolt; it was a bolt from Mother Nature in his own backyard. The 24-year-old says he saw something bright and heard something loud hit his neighbor's yard, but he didn't feel a thing. "I just came back inside like nothing was wrong. Umm ... my arm was sore. But I didn't ... I don't think I saw any marks until 30, 45 ... [it was] maybe an hour before I saw the marks," he tells Gear Diary. Kemp says it didn't hurt when it happened, but a few hours later his arm started to feel achy and sore. Big blisters started forming on his skin the next day, which his girlfriend, a pre-med student, carefully lanced and covered to prevent infection. "The feathering marks are formed by the transmission of static electricity along the superficial blood vessels that nourish the skin," says Dr. Mathew Avram, director of the Dermatology Laser and Cosmetic Center at Massachusetts General Hospital in Boston. "They're the kind of marks that when an emergency medicine doctor sees it, you know exactly what the diagnosis is -- a lightning strike," he explains. "These are an unbelievably rare thing to see," adds Avram. What you tend to see is a superficial burn to the top part of the skin, he says. If the person was wearing a belt buckle or the skin was sweating a lot during the lightning strike, the fern-leaf patterns may be deeper. Although Kemp did not go to an emergency room, Avram said a trip to the ER is generally a good idea, so you don't get any secondary infections from the skin wounds. Usually the red marks fade within hours of the lightning strike, though Kemp's lasted longer than that. It's a good idea to put an antibiotic ointment or Vaseline on the affected skin several times a day until they completely heal. Even a month after the lightning strike, Kemp said he still felt "random pains" running down his left arm and the skin felt tender. "That's not surprising," says Avram. "Any time there's an injury to the skin you can get nerve sensations afterward and the redness from a burn can last for months."